Fishing for yellowfin tuna in the Galapagos can be very difficult. The fish can be as large as 150lbs and can easily fall prey to sharks and sea lions. Male sea lions can be as large as 8ft long and over 600lbs. They are very intelligent, powerful swimmers, have teeth like wolves (they are known as “lobos” by the locals), and are always looking for an easy meal. Even the smaller ones can’t resist a hooked tuna. Once they decide to target the tuna, the angler is in big trouble! 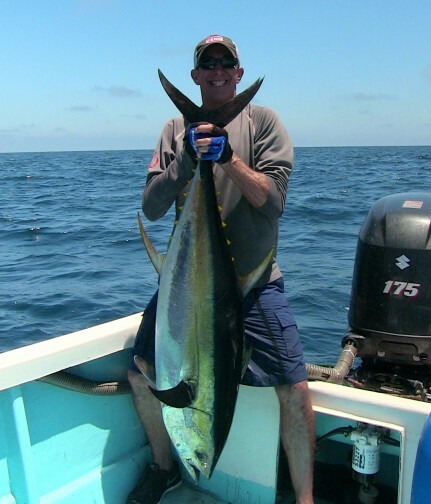 We almost exclusively target these big yellowfin tuna with big poppers on spinning rods. This means that we are limited on how much pressure we can put on these fish. For more information on fishing in the Galapagos visit Sportfish Galapagos. Check out the Yellowfin Tuna Plugging Guide for instruction (includes video) and the Tuna Plugging tackle recommendations. 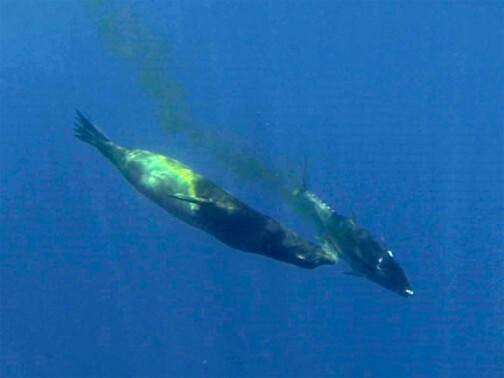 This 100lb+ tuna just barely made it to the boat after being attacked by a 400lb+ sea lion!